the company of good friends and interesting people. Legacy of the Gray Ghost is Historical Fiction. A rather large prologue tells the true story of the legendary John Mosby, leader of a band of Confederate cavalrymen on daring raids deep behind Union lines during the Civil War. His fame came from his ability to strike quickly and then seemingly disappear, earning him the name of the Gray Ghost. 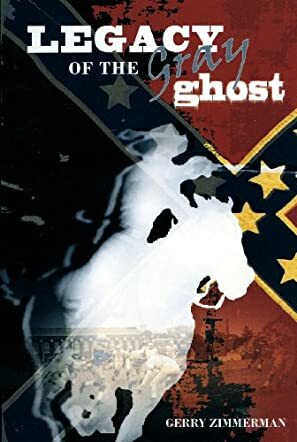 The book turns to the story of how one of Mosby's Raiders, at the end of the Civil War, goes on to found a family that becomes very successful and then establishes Mosby University in Virginia in 1908 in honor of the old Gray Ghost. Much of the story takes place in 1958, the 50th anniversary of Mosby University's founding, and features the very funny behavior of the students and the football team, which had been floundering and was on the verge of being canceled. Readers of historical fiction, humor and football will enjoy reading this story and will cheer the Mosby Raider football team during the historic 1958 season. As a lover of history, I was pleased to read the opening of this story. I was then pleasantly surprised when the story turned to more modern days with an excellent look at university life in the 50's. The setting for the story is quite memorable; the characterization is first rate and the dialog spot on. I particularly appreciated the humor as I read through the exploits of the football team. The author managed to capture the essence of college life in the middle of the century. Well done.